When does the American Birkebeiner Ski Foundation (ABSF) head out to groom? What shapes their decision on when to groom, where and how? How long does is take to groom the Birkie trail? What is the goal of grooming during the week versus a weekend? Below are some Frequently Asked Questions, as well as some grooming procedures the ABSF follows. Any additional questions, stop in the office, give us a call (715-634-5025) or drop us an email (ben.popp@birkie.com). 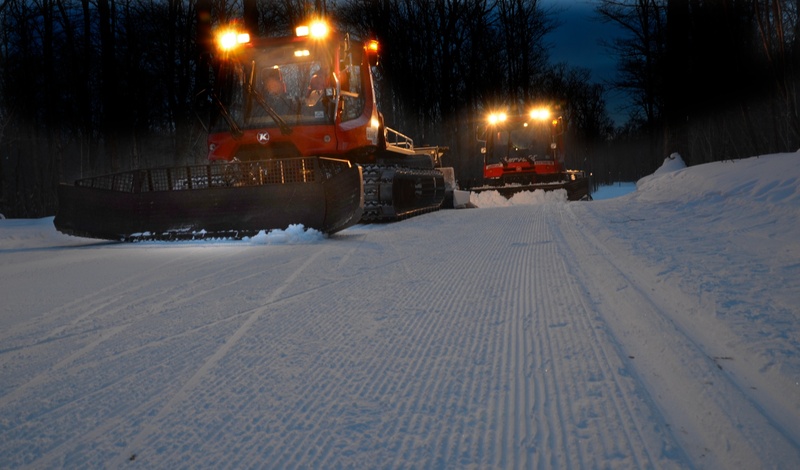 For the safety of skiers, grooming is done at night (approx 9:00pm – 2:00am) when skiers are off the trail. What is the ski “base”? The base is the amount of compacted snow that is on the ski trail, the surface you ski on. It is measured by driving a probe into the base until it hits the ground. How do you choose what equipment to groom with? Depending on the specific situation we choose the piece of equipment to get the job done right. 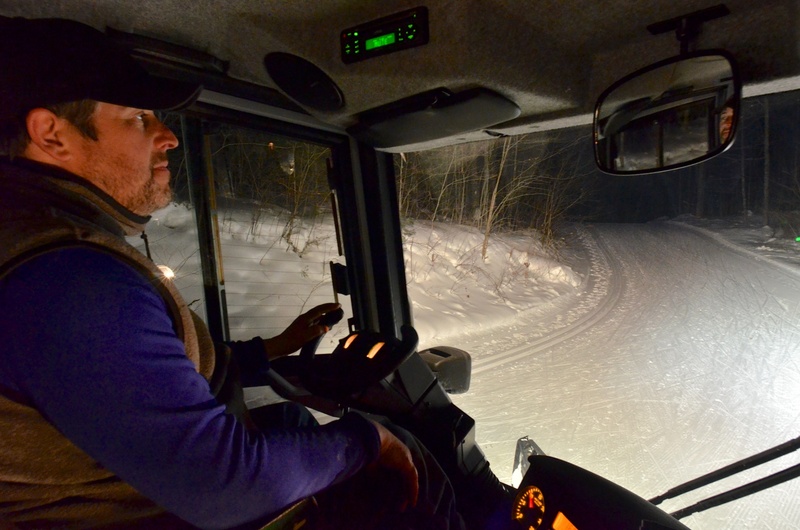 Generally speaking, we use a snowmobile and pull a grooming drag when there are lower snow conditions, when time is a factor (they are faster), or when you don’t need to grind deep into the base to prepare the ski surface. The big red machines (Pisten Bully’s) are used when there is adequate base in place and to prepare the ski surface we need significant amounts of compaction, or lots of “renovation” with tiller (the thing behind the Pisten Bully that spins fast, chews up the snow, and then lays it back down). How long does it take to groom the entire Birkie Trail system? On snowmobiles, it takes 4 people 15hrs, in Pisten Bullys it takes 3 people (we only have 3) 36hrs. What makes the ski surface hard versus soft? Snow conditions and temperature. Colder temperatures after the grooming, with adequate moisture in the snow will result in firmer ski conditions (if allowed to sit undisturbed for 4-6hrs). If conditions stay above freezing, the snow is really dry, or the ski surface is disturbed shortly after grooming, the trail will break down and be “soft”. When do we head out to groom? We groom to make the skiing better! After a snow fall we will get out to compact the new snow into the base, after warm weather we will go out to chew up the ice, or after heavy use, we will get out to try and smooth out the ski surface and reset the classic tracks.